Recuperative sleep not only contributes to the well-being of human beings – it is first and foremost important for health. The message here: quality over quantity. Once the good-night story has been read and the stuffed animal tucked firmly under the arm, it usually doesn’t take very long before the eyes close and the child’s breathing becomes regular. The stress and excitement of the day seem to fade away. But the external tranquillity is deceptive. 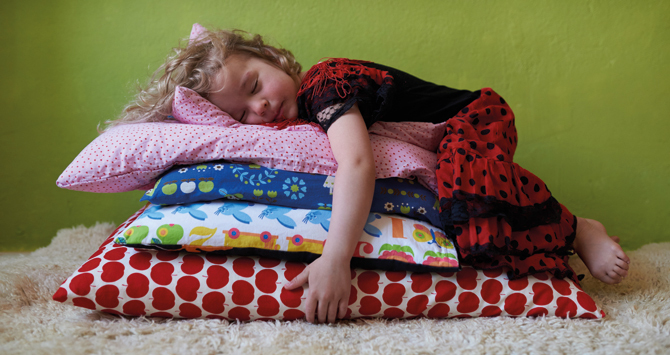 After falling asleep, children as well as adults first of all enter directly into a deep sleep – and during this phase the body is highly active. Scientists today know that the most important purification processes take place during this phase; the immune system is activated, growth hormones are secreted, proteins are built up, and free radicals that arise during metabolic processes and could damage genetic material, are destroyed. Sleep is an important component of our well-being and health. Recent studies have shown that the quantity of sleep is not as important as the quality of sleep. But it is precisely this aspect that seems to be missing for many people. According to statistics from the Robert Koch Institute, eleven percent of the German population perceive their sleep to be “frequently non-restful”. About 25 percent complain about sleeping disorders. The first deep-sleep phase after falling asleep lasts about one hour, then the first dream-phase ensues. Since the eyes move quickly back and forth under the eyelids during this phase, it is also called the REM phase, short for Rapid Eye Movement. Scientists assume that during the REM phase the events of the previous day are processed. Furthermore, the brain is exercised. A hormonal imbalance related to sleeping disorders or sleep deprivation leads to a risk of acquiring diabetes and adiposity, also known as obesity. “Thus a deficiency of the hormone leptin, which inhibits our hunger pangs, associated to sleeping disorders can promote obesity,” says alfred Wiater. Increasing globalisation and permanent availability of communication severely disrupts the day-night cycle, which in turn leads to sleeping disorders. “The optimal sleeping environment is dark, quiet and temperature-controlled to maximum 18° Celsius,” says Alfred Wiater. Hence darkness induces secretion of the sleep-onset hormone melatonin. If it is absent, or if it is available only in short supply, due to artificial light for example, it disturbs the natural wake-sleep rhythm – sleep is not as good. Not only artificial light sources counteract the natural light-dark influences; most people’s daily routine also requires them to get up at a certain time. Of course, we can add that alarm clocks, mobile telephones and increasing traffic disturb our sleep. We can only appear to grow accustomed to new circumstances and disruptive factors. “If we sleep for a while with extreme noise or in bright rooms, we do indeed have the impression that we can deal with it, but data show that the physical consequences continue to exist,” says Ladwig. The same is true of the increasing insecurity that we perceive these days when planning our lives, due to our modern society.” This is because our mood as well impacts the quality of our sleep. On average, every individual wakes up between 20 and 25 times every night. Studies have shown that one can however only remember it the next morning if one was awake longer than 90 seconds. “Noise assures that both the conscious and unconscious wake-up reactions increase and that our normal sleep cycle is changed,” says Uwe Müller. Sleep is then less recuperative. And also the risk of depressions and cardio-vascular diseases increases over the long term. But it is certain that flight noise is not good for the body. The NORAH data substantiate that bodily reactions even appear when people think that they have grown accustomed to noise. Flight bans at night could provide some relief, but they still haven’t been prescribed everywhere. The study has however also shown that flight noise alone does not determine whether the local residents feel tired or not. In the study, the subjective sense of drowsiness was measured with a questionnaire on a scale of 1 (very awake) to 9 (very tired). “Even though the wake-up reactions of our test subjects have decreased since the introduction of the core rest period in Frankfurt, they indicated that they still felt just as drowsy the next morning,” says Müller. What exactly this result signifies will have to be examined further by the research scientists.